It’s been an exciting year for i95Dev as we announce our participation in the fourth event of the year, IRCE Focus Brands & B2B. All events so far this year have boosted the reach of our business and have emboldened us in the knowledge that our innovative products are leading the field. 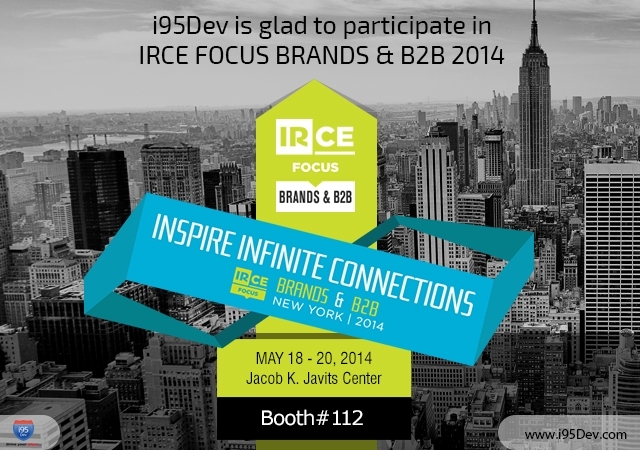 IRCE Focus Brands & B2B is coming up May 18-20 at the Jacob K. Javits Center in New York City and is sure to be a remarkable event with insights about what’s happening in the world of B2B and B2C e-commerce. The event is expected to place a spotlight on strategies for brands, manufacturers and wholesalers and will effectively increase awareness on how to manage direct to consumer relationships, channel complexity and digital brand marketing. What i95Dev Brings to IRCE Focus?